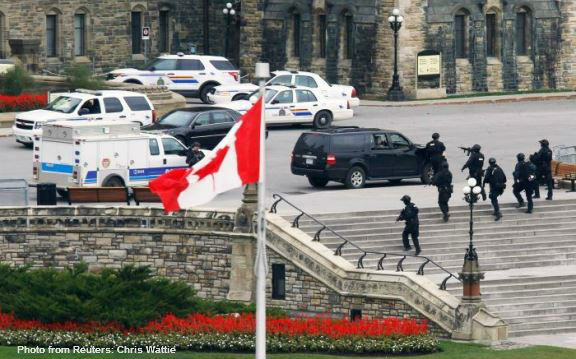 A masked gunman killed a soldier standing guard at Canada's war memorial Wednesday, then stormed Parliament in what Canada's prime minister called the country's second terrorist attack in three days. A government official told AP that the gunman Michael Zehaf-Bibeau.was a recent convert to Islam. The official spoke on condition of anonymity because the person was not authorized to discuss the case publicly. Canada was already on alert because of a deadly hit-and-run assault Monday against two Canadian soldiers by a man Harper described as an "ISIL-inspired terrorist." ISIL, or Islamic State, has called for reprisals against Canada and other Western countries that have joined the U.S.-led air campaign against the extremist group in Iraq and Syria.